I have been waiting nearly a year to share this recipe with you guys! I originally made it last year while I was still living in Florida and posted this picture to my Instagram feed. I remember the peaches being fantastic last summer and I couldn't get enough of them. 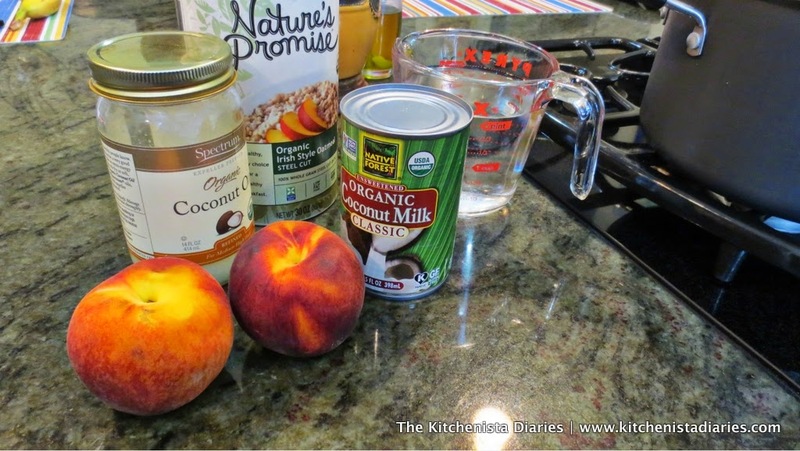 Out of all the peach recipes I tried, this was by far my favorite. Sadly, I lost many of my photographs between moving and a broken laptop, so I never got around to posting the recipe. Ever since then I've been itching to recreate this dish. 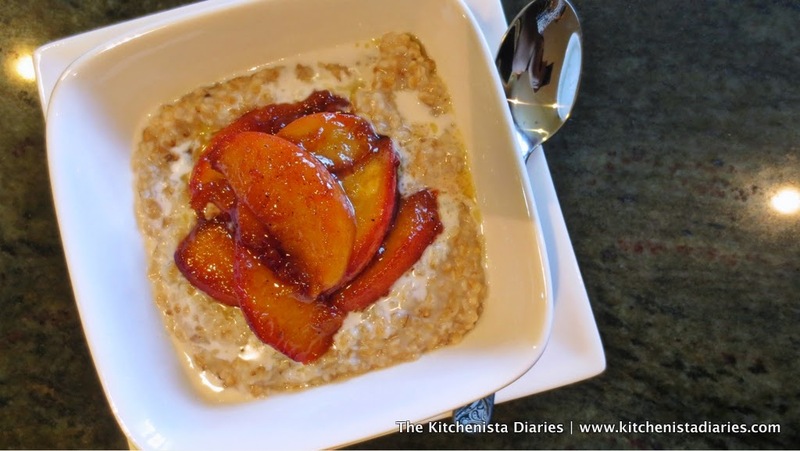 Feel free to use regular rolled oats instead of steel-cut if you wish (just adjust cooking time) however you simply must use fresh peaches! The best time to buy them is of course while they are in season. You'll see them showing up at farmer's markets and grocery stores towards the end of spring and beginning of summer. 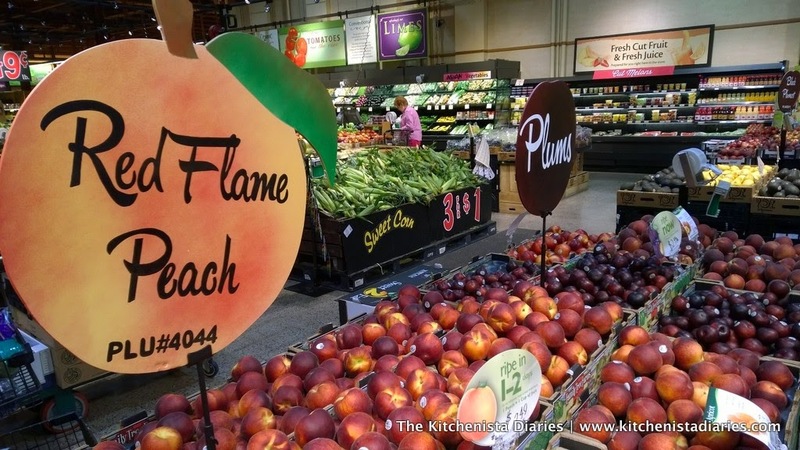 When I saw the huge stone fruit displays at Wegmans, I nearly squealed in delight that the time had arrived! When I was a kid, we used to eat the instant oatmeal packets pretty regularly. It wasn't until well into my twenties that I even realized there was better oatmeal to be found in the world. The peaches & cream flavor was definitely one of my favorites, even if it was really just mush and dehydrated peach flakes. Still, I had fond memories of the stuff and wanted to bring it up to par with the better quality ingredients I prefer to eat nowadays. As with any recipe that only calls for a few ingredients, you'll want to use the best that you can so that it really shines. 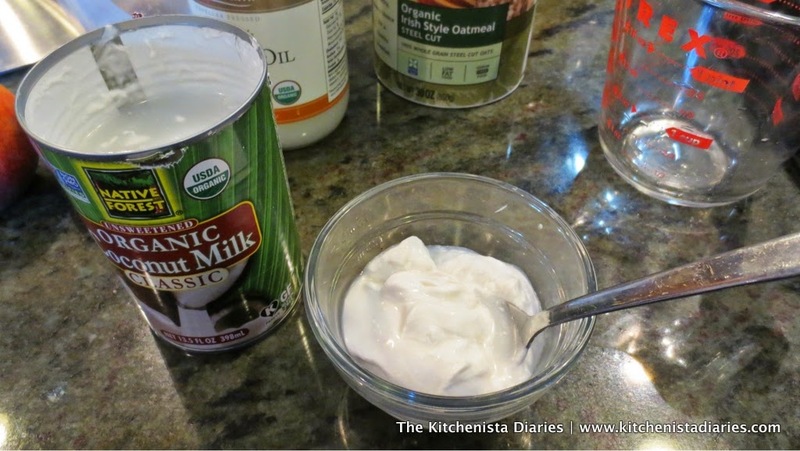 I didn't set out to make a vegan recipe originally, but when I happened to be out of heavy cream that day and found a can of coconut milk instead, a vegan version was born. 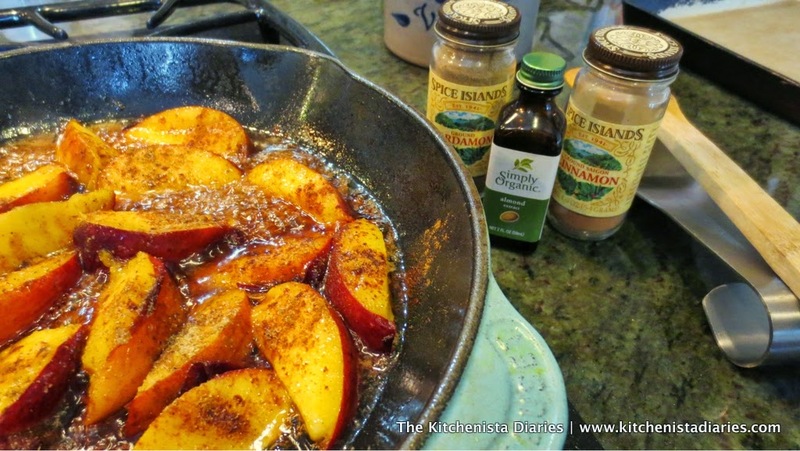 Instead of using butter to caramelize my peaches, I went ahead and used coconut oil in keeping with the theme. Use my recipe as a guide more than anything else though. 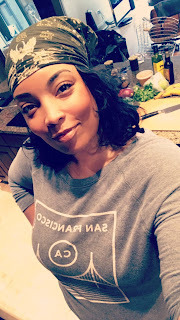 Coconut milk or vanilla almond milk are great options to keep it vegan; whole milk or heavy cream would work just fine as well if that isn't a concern though. Breakfast shouldn't be too complicated in my book. 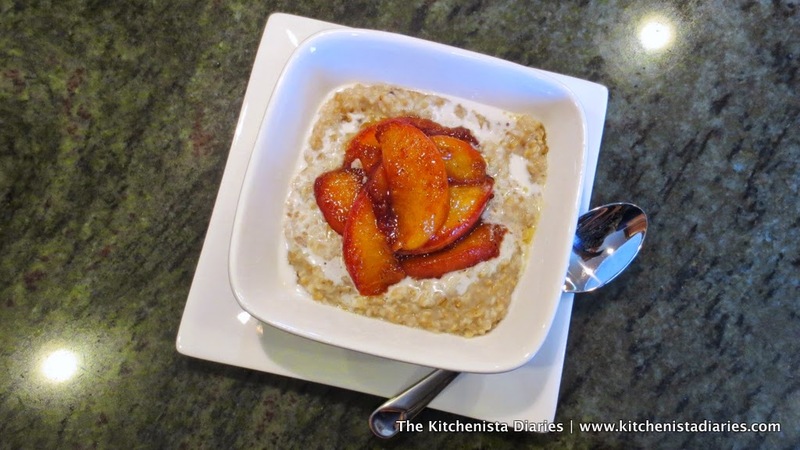 I guess oatmeal is an odd thing to crave once it starts getting hot, but to be honest it's just a vehicle for these delicious caramelized fresh peaches. 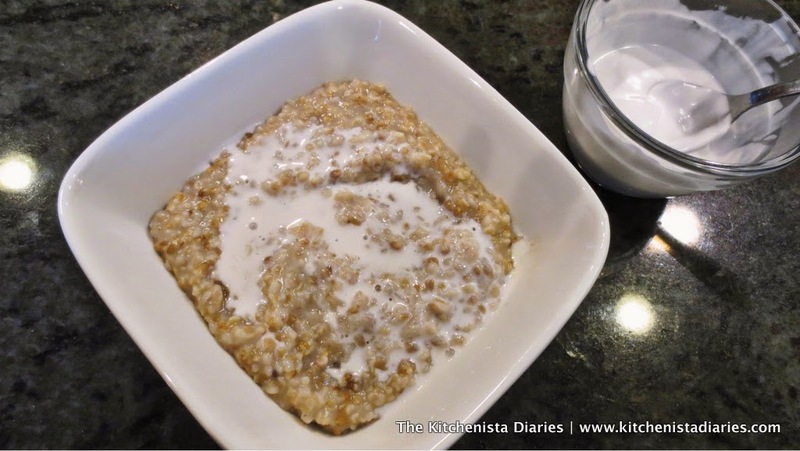 Bonus, steel-cut oatmeal is a hearty and delicious way to start your day. They take a little longer to cook than rolled oats, but I like the texture better personally. 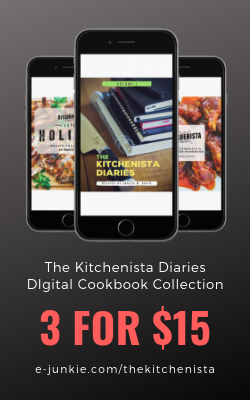 I used some tips from TheKitchn to get a pot cooked in thirty minutes. That's not quite the couple minutes you'll spend microwaving an instant packet of oats, but I can promise you the extra time is worth it. 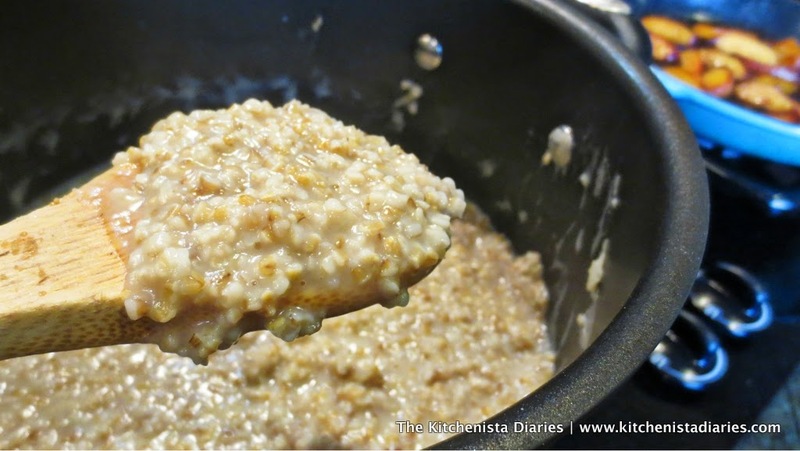 Just one cup of steel-cut oats will make a pot that serves about six, but leftovers reheat really well so it's a nice weekend project to get some meal prep out of the way. 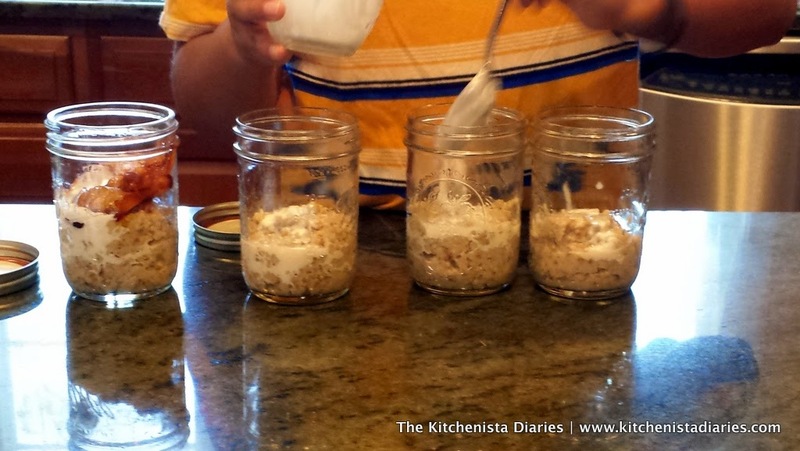 I put Jaden to work filling up these mason jars so that we'll have a few days of breakfasts ready for his last week of school! Bring the water and coconut milk to boil in a large pot. If you can, reserve some of the thick layer of coconut cream that is usually at the top of the can. 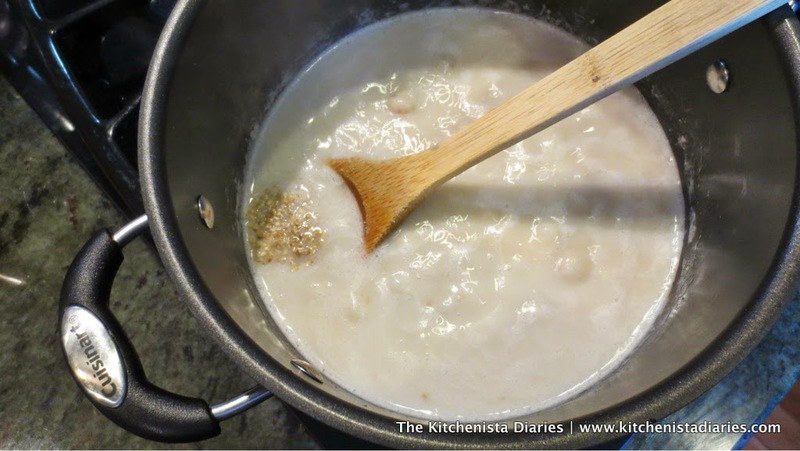 Once the water and coconut milk are boiling, add the cup of steel-cut oats and a good pinch of salt. Stir and let the mixture come back to boil, about a minute. Reduce heat and simmer, stirring occasionally. 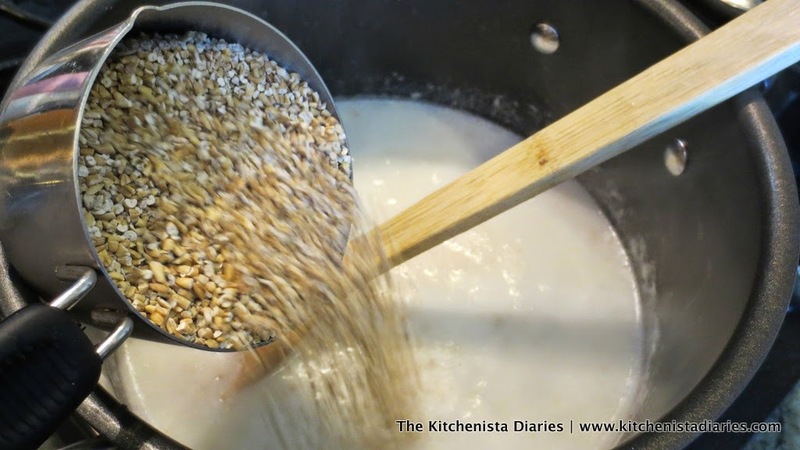 After about 15 minutes or so, the steel-cut oatmeal will have thickened up. Stir in 2 tablespoons of the brown sugar. At this point you can also get a feel for whether or not you'll need some additional water. If you prefer softer, creamier oats, an extra half cup or so will get you there. 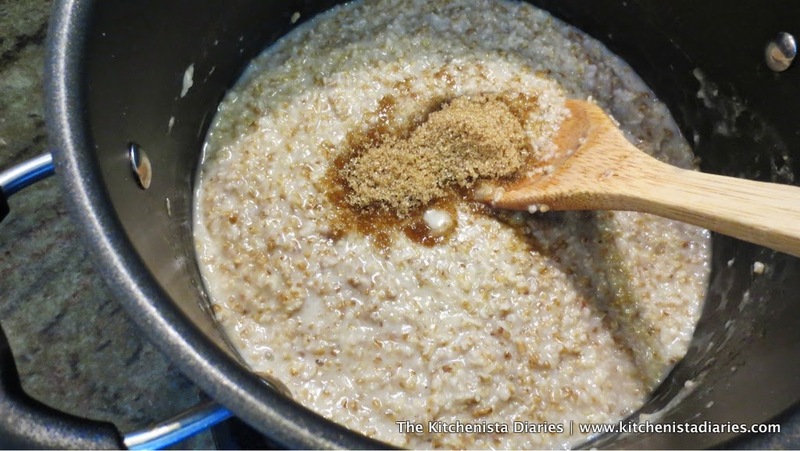 The steel-cut oats will be of a porridge consistency between the 20 to 30 minute mark, depending on how much liquid you used. After you make this a few times you'll probably have a good idea of how to get it just the way you like! 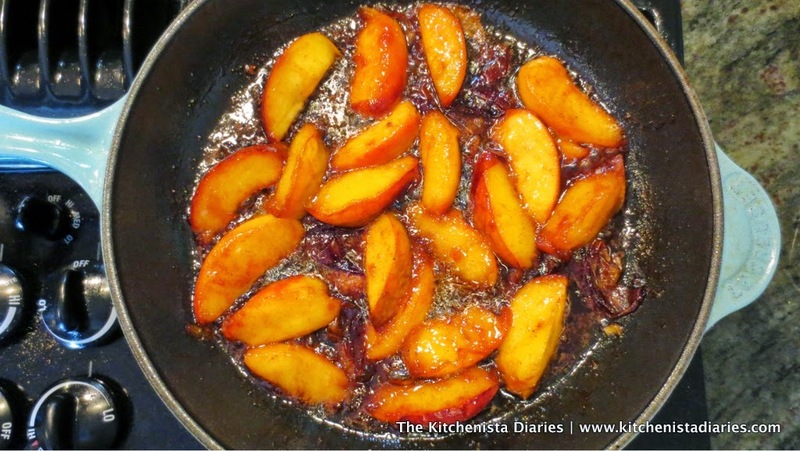 While the oats are simmering, you can prepare the caramelized peaches. I only cooked two here as seen in the pictures, but if you want enough to serve with the full pot of oatmeal, you'll want to follow the recipe for four peaches. 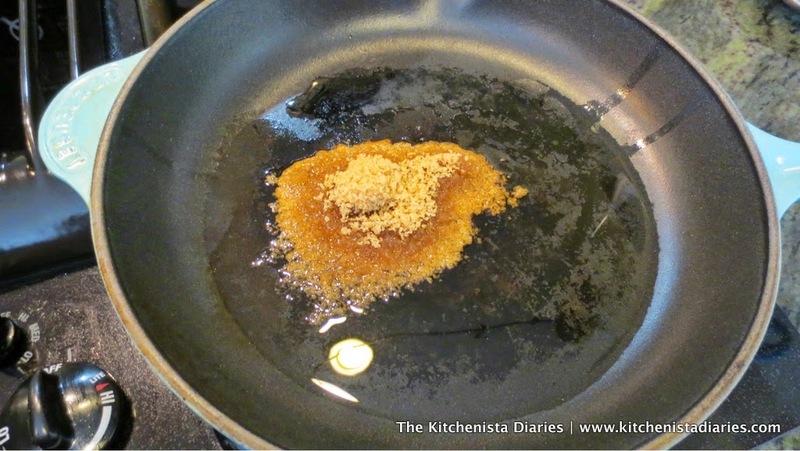 Heat your skillet over medium heat and add the coconut oil and remaining brown sugar. Stir the sugar just enough so that it starts to melt, about a minute, and then add the sliced peaches. There is really no need to take the skins off as they will peel off for the most part during the cooking process. 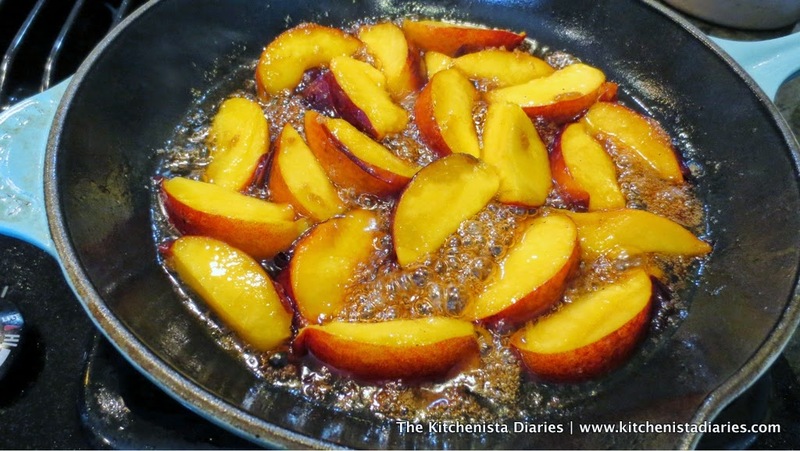 As the sugar starts to bubble, gently toss the peaches to coat. Season with cinnamon, cardamom, vanilla extract, and a tiny pinch of salt. Have you cooked with cardamom before? It's an expensive little bottle but I'm really finding the warm flavor lovely in spiced desserts as well as curries. If you don't have any on hand, it's okay to supplement with more cinnamon or even some freshly grated nutmeg. Regardless of how you decide to spice the peaches, just remember that a little goes a long way. When fruit is this flavorful and ripe in season, you don't want to mask all that freshness. 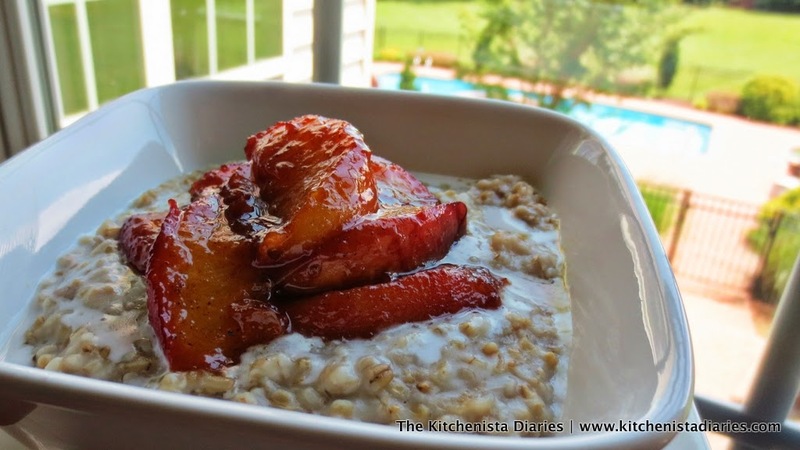 Reduce heat to low and allow the peaches to slowly caramelize while your oatmeal cooks, about 10 minutes or until soft and syrupy. Most of the skins will pull off on their own. If they bother you, just give the rest a little tug before serving and they'll slip off easily. To serve, ladle a cup of cooked oats into a bowl and spoon a little bit of the reserved coconut cream over the top. Add a few slices of caramelized peaches to the center of your bowl, and you've got a delicious - and strikingly beautiful - breakfast on your hands! This blows those little packets of oatmeal out of the water, trust me. I really couldn't think of a more perfect way to kick off peach season!